In 1795, Wolfe Tone left Ireland for America. He used his contacts with influential families, such as the Beresfords, to avoid imprisonment by supplying information on affairs between himself and two fellow United Irishmen, Hamilton Rowan and English cleric William Jackson. Jackson had been betrayed to the authorities by an attorney called Cockayne and later committed suicide. Before leaving Ireland Wolfe Tone went first to Belfast with his family where he participated with Joe McCracken and Russell in what is known as the Cavehill Compact. This compact bound them “to never to desist in our efforts until we subvert the authority of England over our country and asserted our independence”. In America he found that he disliked the new republic feeling that it was based on wealth rather than personal worth. So in 1796, in the company of fellow United Irishmen, Tandy, Reynolds and Rowan he went to Paris to seek aid from the revolutionary government of France. To his own surprise, he immediately received an audience with Lazare Carnot, one of France’s five Directors. Carnot was impressed by Tone and made him adjutant-general in the French army. He also agreed to raising an expedition for the intent of landing in Ireland. This expedition was to be led by Louis Lazare Hoche, one of France’s most capable generals. The French moved fast and on 15 December 1796, Tone, in the company of 45,450 experienced French troops set sail from the Breton port of Brest. The fleet consisted of 43 warships, carrying a vast amount of arms, and it was hoped that by sailing in mid-winter they would avoid the English fleet. 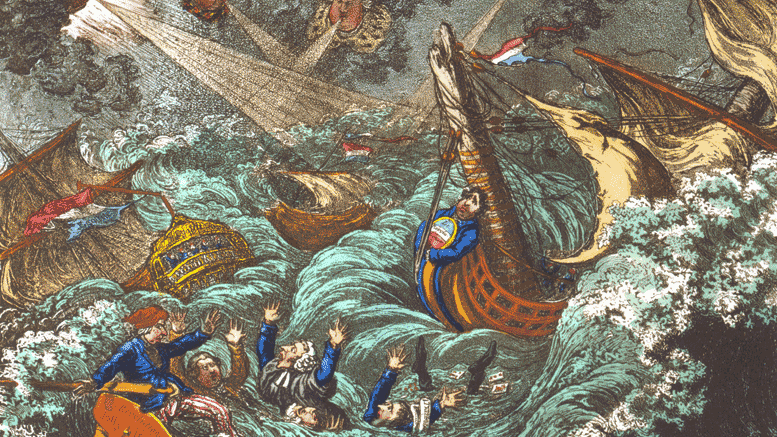 As the fleet left harbour one of the vessels, the Séduisant, struck a rock and 1,255 men lost their lives. Only 45 survived. Then soon after this the Fraternité, with General Hoche onboard, sailed out of sight. It was unable to rejoin the fleet again. The rest of the fleet continued towards Ireland and on 22 December they anchored in Bantry Bay. General Grouchey, second in command to Hoche decided to wait until the Fraternité would appear. When there was no sighting of the ship Grouchey agreed to land on Christmas day. This was a mistake for the weather grew much worse and on 26th December in the face of violent gales the French were forced to cut ropes and return back to France.